Facebook is able to achieve this through the Facebook Pixel. It is a piece of code you load on your website that lets Facebook track what users do, what pages they look at, or whether they make a purchase. Then, Facebook uses this information to target those users. It will populate your Dynamic Product Ads with information taken directly from your product data feed, which you must upload to Facebook. In addition, Facebook recently announced an update to Dynamic Product Ads, which lets you target “broad audiences”. For example, users who have not visited your website before, but have shown (through their browsing habits) an interest in buying similar products to yours. Before Facebook introduced Dynamic Product Ads, Google’s advertising products (as well as the advertising products from other shopping platforms) had an advantage because of user intent. In other words, consumers use Google Search or Google Shopping when they want to buy something. This is the purchasing intent indicator. For a long time, Facebook didn't have the ability to target ads at users based on buying intent. Dynamic Product Ads gives it this ability. Set up a Catalog - Catalog is the term Facebook uses to refer to a product data feed. Thus, setting up a Catalog means uploading your product data feed to Facebook, keeping it up-to-date, and optimized. DataFeedWatch automates this process. Build an audience - Facebook displays Dynamic Product ads to its users who have previously visited your website or app. For example, they may have viewed a product or made a purchase. Also, they might have put items in a shopping cart, but abandoned it before completing the transaction. Facebook tracks these actions using the Facebook Pixel (which you install on your website) and App Events (which you install on your app). It then uses this data to create your audience. Create ads - the final stage is to create a template for the ads. This is what Facebook will deliver to your audience with information from your Catalog. You can create different campaigns for each audience you create. This is beneficial as you can build very specific audiences. For example, you can create an audience of people who have visited particular pages on your website, but haven't visited others. Or, you can create an audience of people who haven't visited your website in a while. Facebook is maintaining its focus on buyer intent with its rollout of broad audience targeting. When you select broad audience targeting, Facebook will show your ads to users who have visited websites that sell similar products to yours. The Facebook Pixel and App Events tools give Facebook this information. Using a broad audience means you are not as reliant on traffic to your website for Facebook Dynamic Product Ads to deliver a return on investment. Not everyone has access to the feature, but Facebook is rolling it out. You still need to upload a data feed to Facebook and you still need the Facebook Pixel installed on your website for the broad audience feature to work. 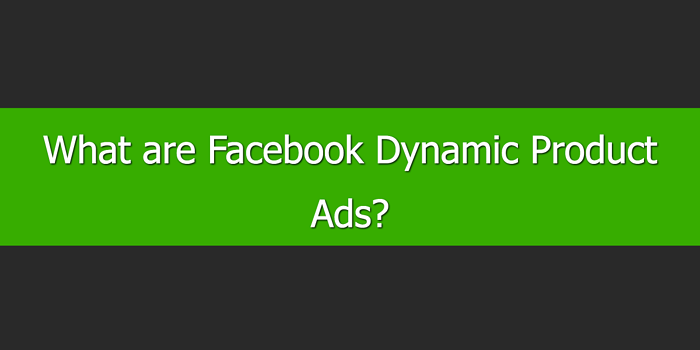 Facebook Dynamic Product Ads let you stay front of mind with potential customers. It also re-engages previous customers, upsells customers, and finds new customers. Thus, it is a tool that can deliver a significant return on investment.